Some exercises become so common that few people take the time to question their validity. Perhaps they began as specialty exercises intended for use in specific contexts -- by patients in rehab, for example, or by advanced bodybuilders who need the most challenging variations of certain movements. Some trainers noticed the exercises worked for those specific trainees in those specific situations and started pushing the workouts toward the middle, to be used by everyone. Over time, the exercises become a bit too popular, and they end up vastly overrated. But keep in mind that "overrated" does not mean "bad." It simply means there are better choices than those that are currently popular. The plank makes sense in yoga, where you hold the plank pose for a few seconds then transition into another pose. It makes sense in rehab, too, where the goal is to build awareness of optimal body alignment in a static position. And when trainers began to use it for entry-level clients, it seemed like a great idea. 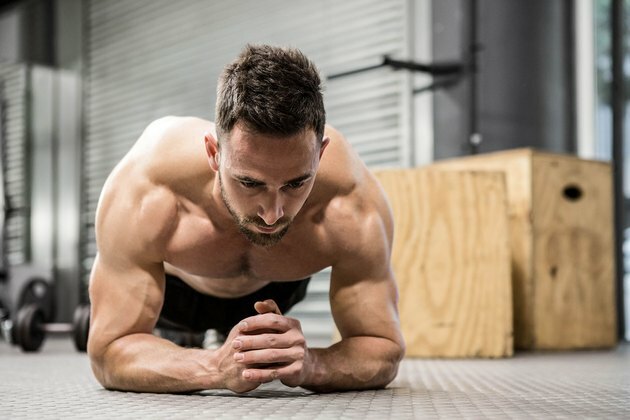 After all, people who exercise should be able to hold a plank -- with their body weight resting on their forearms and toes, in the classic pushup position -- for at least 30 seconds. The reason this exercise is overrated, though, is because trainers too often recommend the beginner version without ever showing progressions to more advanced and useful exercises. Once you have an awareness of what it feels like to have a properly aligned torso, and once you have a base of core stability, you need to move on to exercises that challenge your stability dynamically. That's where it counts. Maintaining alignment when you're moving is the difference between getting hurt and staying in the game. Two examples of how to progress planks and side planks from static to dynamic exercises are the pushup and the walking lunge. If you can hold a pushup position for 30 seconds, you may as well progress from that to sets of 15 pushups, using a 1010 tempo. It's still 30 seconds in the plank position, but now you've added a dynamic challenge. Once you can manage this, do 15 pushups with one foot off the floor, at the same tempo. Then switch feet, and do 15 more. When these variations are easy to accomplish, do 15 pushups, at the same tempo, lifting one hand off the floor after each rep. Then switch hands, and do 15 more. And once these are no longer challenging, start T-roll pushups, such as those featured in the Resources section. T-roll pushups cover your front plank, side plank and rotary control -- all in one exercise. Plus they build dynamic control, which always has more athletic carryover than static variations. The side plank is more challenging than the front plank, and fewer people can hold it for 30 seconds on each side right off the bat. But once you get to the point where that's easy, the same principle applies: You need to learn to use that lateral stability during dynamic movement. One excellent exercise is the walking lunge with an unbalanced load. If you can do walking lunges with 35-lb. dumbbells in each hand, try them with a 70-lb. dumbbell in one hand. It takes tremendous lateral stability to keep yourself upright when all the challenge is coming from one direction. And as a bonus, you'll work your entire lower body as well as your core -- and the gripping muscles in your hands and forearms aren't just along for the ride. In some cases, intermediate and advanced lifters get stuck doing beginner exercises, but the hanging knee raise is an example of the opposite situation: an advanced exercise that's become popular with intermediates. The hanging knee raise is a great choice if your abs are strong enough to tilt your pelvis upward from that position. In other words, you don't want to just raise your legs in the air. While that's a good way to work your hip flexors, it's not working your abs through a full range of motion. For that, you need to be able to lift your legs and tilt your pelvis upward. It's extremely hard to do, which is why very few people you see hanging from elbow straps and lifting their legs in the air are able to complete the exercise. 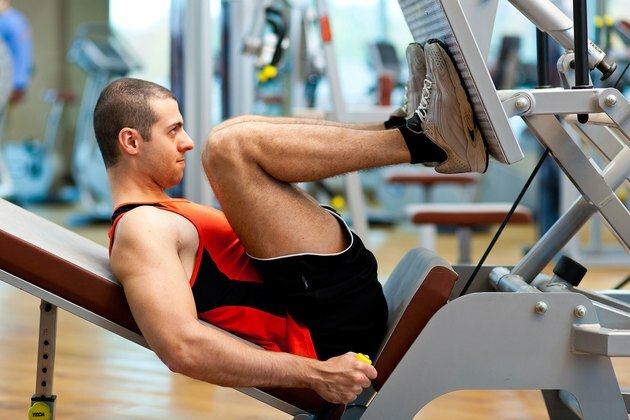 You could say the same thing for the knee raise from the captain's chair, which may be an even worse choice because it encourages you to stop the movement before completing it with the pelvic tilt. First, try to perform the hardest version of the reverse crunch exercise. If you can't do this, you've got no business doing hanging leg raises, because you certainly aren't doing them well. Lie on your back, holding a broomstick, or something else that's straight, solid and light, directly up over your chin. Your feet are off the floor with your knees bent at about a 90-degree angle. Roll your hips up and pull your knees to your chest without lifting your head off the floor or moving the bar from the starting position. If you're strong enough to do that, you're probably strong enough to try hanging knee raises. If you aren't, do reverse crunches on the floor -- or on a decline bench with your head higher than your hips -- and focus on building the strength to do that pelvic tilt. It's clear why lifters like to do close-grip rows using the triangle attachment: They can use more weight and the contraction feels more intense throughout their shoulder girdle. That's because the shoulders are more internally rotated, which involves chest and shoulder muscles along with the lats. When you do the exercise, it will feel like you're using more muscle -- because you are. You're also putting your elbow flexors into a stronger position, thanks to the neutral grip. But because you leave off the final 2 to 3 inches of your full range of motion on a rowing exercise, you're not getting a complete contraction of your lats and traps. If you'd like a better alternative, try a slightly wider, neutral-grip row if your gym has that attachment. If not, simply use those PVC-style handles that are attached to straps. What you may sacrifice in load with either of these grip options, you'll make up for with the greater range of motion -- and perhaps greater involvement of your middle traps and rhomboids in conjunction with your lats. Some bodybuilding coaches offer passionate defenses of the leg press, arguing that it's a good choice for some lifters in some situations. And this is indeed true. But the reverse is also true: It's a poor choice for most lifters in most situations. That's because when you do the leg press, you become a part of a machine that resembles a huge accordion -- with you in the middle. That is absolutely the wrong position to be in when handling a heavy weight. The higher you place your feet on the platform, the more hip flexion you create. And the greater the hip flexion, the faster you lose the natural lordotic curve of your lower back. Just as you wouldn't do a deadlift with a rounded back, neither would you want to push a heavy weight on the leg press from that position. If you feel that back squats don't hit your quads hard enough, try front squats. When those grow boring, try split squats. These options are much safer on your back and have more functional carryover to real-life and sporting actions. There's no doubt about it: Tire flips are one of the coolest-looking exercises you can possibly do. It's also one of the most dangerous moves and a perfect example of a contest-specific exercise created for advanced-strength athletes that just got too popular. Florida-based personal trainer Rob Simonelli agrees. "Tire flips are best used for folks who'll have to flip tires in some sort of strength competition," he said. Furthermore, hardly anyone has the hip mobility to do it right. Just about everyone, including Strongman competitors, goes into lumbar kyphosis -- a rounded lower back -- when they bend down to grip the tire. World-famous, Boston-based strength coach Mike Boyle said, "Most people don't have bad backs. They've got bad hip mobility, which causes their bad back." When it's used as a training exercise, the goal is to work the posterior-chain muscles, like the lower back and the hamstrings. That's something you can accomplish very well with deadlifts. The only real benefit to doing tire flips is the fact they're often done outside, where other people can see you doing these stunningly badass exercises. But "because it's badass" isn't necessarily a good reason to do it. Always try to keep in mind that the reason you're exercising in the first place is to improve -- your health, your strength, your body or your attitude. So focus on exercises that help you advance toward this objective, and skip those that don't. The catalog of overrated exercises covers a lot of territory. Its workouts, created for specific populations and specific contexts but now applied too broadly, are generally a detriment for most who use them. But they are not detrimental because they are bad workouts per se. There simply are better exercise choices out there. After all, doing an exercise you've outgrown or that was not created for people in your situation -- or simply because it looks cool -- doesn't often contribute to an effective training session. On the other hand, there is no rule that dictates you must always use the absolutely best exercise during every workout for every muscle group or movement pattern. Perhaps right now, in your current stage of training, one or all of these exercises actually are good choices for you. The secret is to assess yourself and your individual situation then decide which exercises are the best ones for you and which can be tossed out like an old tire. What Muscles Do Shoulder Shrugs Work? Can I Use a Dumbbell for Kettlebell Exercises? Are Pull-Ups Enough to Work Out Biceps?